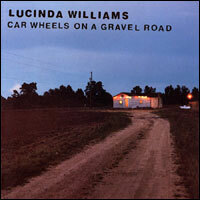 I feel like I’ve mentioned Lucinda Williams’ 1998 Car Wheels On a Gravel Road about a thousand times on this blog. So I checked and the actual number is thirteen (not counting today). This is another of my desert island discs and one I can’t help but reference frequently. That’s because it does so much right in so many different ways. It rocks awfully damn hard but also contains moments of great tenderness. It is filled with simple but profound story songs, such as the title track’s childhood reminiscence of an early morning car ride or a woman stripping down to wait for her lover in bed (in opening track ‘Right on Time’).